Even as US President Barack Obama announced $46 million in new assistance for the Ukrainian military, Russian President Vladimir Putin on Thursday hit out at Western nations for sanctions which he said violated the basic principles of the World Trade Organization (WTO). “The limitations introduced against our country are nothing but a violation by some of our partners of the basic principles of the WTO. 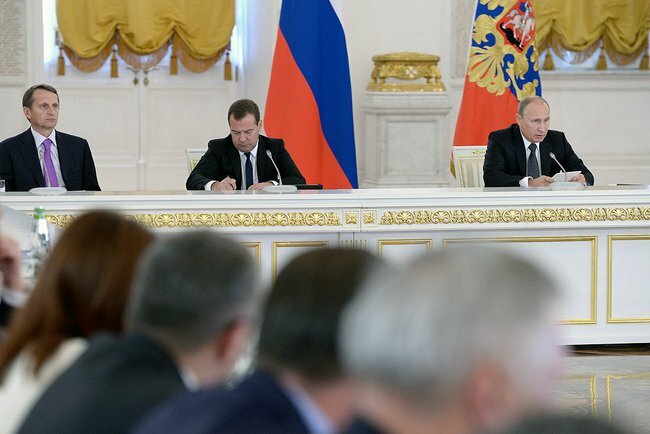 The principle of equal access for all countries involved in economic activity to the markets of goods and services is being violated; the most favoured nation treatment in trade and the principle of fair and free competition is being ignored,” Putin told a State Council meet on Thursday. The US and the European Union announced new sanctions last week to punish Moscow for its alleged backing of separatists in eastern Ukraine. This round’s sanctions targeted Russian state-run and private oil and gas companies, including Gazprom, Rosneft, Transneft, and Lukoil. “All this is politicised, there is no adherence to the generally recognised rules of the World Trade Organisation that I have just mentioned. A number of countries have actually unilaterally deleted these and some other WTO principles for Russia, which is one of the six largest economies in the world,” he added. Against the backdrop of increasing sanctions, Putin on Thursday said the Russian economy can survive only if it becomes more domestically self-reliant and more competitive on the global markets. The survival of Russian enterprises, he said, would also depend on their ability to produce high quality goods. “Russia must offer the global markets not only raw material, but also final machinery products,” he said, adding that the country should make a big leap in the next year-and-a-half to two years to increase competitiveness of its real sector. The Russian Ministry of Economic Development predicts a GDP growth of 1.2 per cent in 2015, while the Bank of Russia expects the country’s economy to grow by 0.9-1.1 per cent next year. In an address to a joint session of the US Congress, Ukraine’s President Petro Poroshenko on Thursday asked for lethal military assistance from the US for the Ukrainian army. World War 3 is happening as we read this and is going to end nuclear. Wait and see. It is a shame, that west had to plan a coup d etat in Ukraine. assigning radicals to run the country. All for forcing it into E.U. And NATO. And those who don’t believe it, should clean their eyes. Before the coup, or protests, you could see Cameron, U.S congress, E.U saying, “Ukraine is more on Europe than in Russia”. Once Putin granted the loan, U.S and E.U and Cameron were quick to say, ” That deal is to get Ukraine into Russia”. Clinton added, “Putin is forming the Soviet Union and changing Russia again”… All proved lies and propaganda. Russia should remain into BRICS, nurture it, SCO, and other organizations, including Merkosur, etc. Buy fisheries where salmon is catch. Send ships to catch with governments permissions. Build strategic BRICS , an assault to one is an assault to all.. Build common platforms. For speed boats, ships, planes. where each country can add it’s own engines , instruments etc. Add SCO into all. EEU will be in BRICS and SCO, in January. Who will lose what? U.S made a BIG mistake. And arming Ukraine could trigger WW3. Or another Georgia 2008. WTO is a U.S organization to align all countries in a U.S dictated economic space. BRICS should have counterpart ONLY for BRICS members. Yes, we are already in WWIII, but it is going to be economical for a very long time, Western nations do not have “guts” to attack Russia, so it will be done by proxy states. BRICS too should expect problems of some kind, because the empire is trying to weaken all. But a multi polar world is a reality, and US-UK economies are not doing well at all, so may be “pragmatism” will prevail and collaboration will start to replace confrontation. It is “terrifying” to see Western mentality so far behind in accepting the “changing of times”, and so bent on conquering instead of dialoguing.